I could essentially write this conclusion in one word: magnificent. Samsung's SyncMaster 172W has been an absolute treat to review. While it's street price is a semi-steep $649USD, keep in mind you're paying for an excellent 17" LCD monitor. The menu system for the SyncMaster is smart and simple- navigating with it's front panel buttons is a breeze. Samsung's MagicBright feature is also a nice addition for having quick access to the brightness of the monitor. I also found the Dual Hinge System to be a nice feature as it was very easy to adjust the tilt and height of the screen. However, I would have liked the main arm to have just a little bit higher raising radius, but that is just me being picky. My girlfriend was impressed by the SyncMaster's picture when we watched the movie on it and with that I can say- chicks dig the monitor. Slight problem with the maximum height allowance (not a big deal, I'm pretty much used to it now). Speakers could be better, but I can't expect much from built-in monitor speakers. 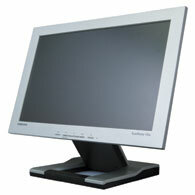 Overall, I was very impressed with the SyncMaster 172W 17" LCD monitor and I give it a 9.5 out of 10.